Small hatchbacks are great for buyers who want to save money and have a roomy interior. 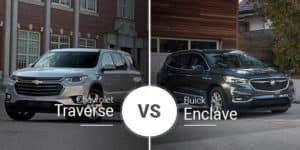 The 2019 Chevy Spark and 2019 FIAT 500 offer this and more. Though they have similar features, they cater to different crowds in the Linwood area. 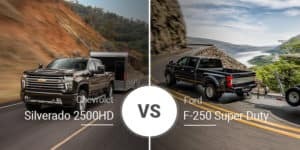 Find out which is better for you below. Mini hatchbacks are all about the funky look, and these two have that down to a science. The 2019 Chevy Spark went through a refresh that brought in a slightly more traditional nose, but it still features a quirky look with its high roof, short wheelbase, sawed-off back end, and tiny wheels. 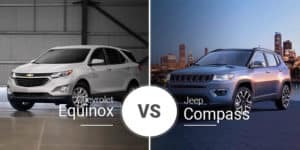 Add to that the funky and more rugged-looking ACTIV model with black body cladding, exclusive grille, and wheels. 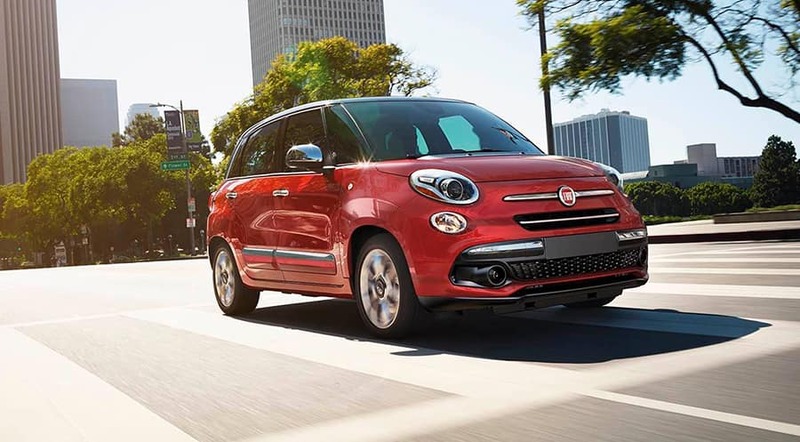 The 2019 FIAT 500 is the originator of the quirky hatch with its narrow body, high roofline, and bubbly body. It also boasts plenty of style in its more premium Lounge model and the performance-oriented Abarth model. While some may find the 500 just a little over the top, there are plenty of Linwood area buyers who would love this design. The Chevy Spark is smaller than the 500 in every key measurement except wheelbase, which it wins by a surprising 3.3 inches. Inside, the funkiness continues with the Spark’s colored dash insert, swoopy dash, three-spoke steering wheel, and other splashes of color. The Spark gets a little boring in certain areas, but there is enough spice to keep things lively. 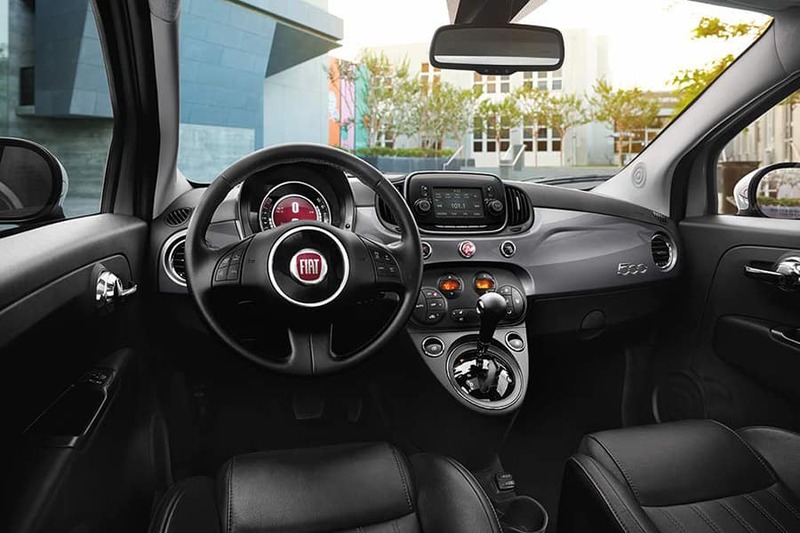 In the FIAT 500, there is even more adorable quirkiness with its large colored dash applique, dash-mounted gear shifter, rounded touchscreen, large HVAC knobs, and additional styling bits in the Abarth model. There are even luxurious touches in the Lounge trim. 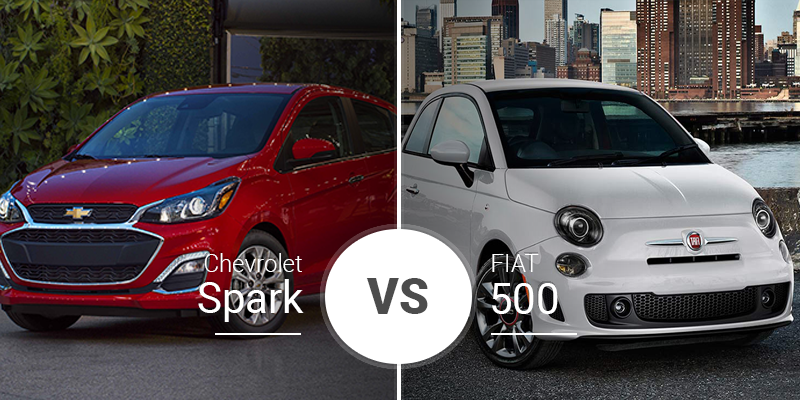 Despite being $2,000 cheaper, the 2019 Chevy Spark is actually better equipped than the 2019 FIAT 500. Its list of standard goodies include a 7-inch touchscreen, Android Auto, Apple CarPlay, Bluetooth audio streaming, 4G LTE Wi-Fi, and tons more. The 500 doesn’t even come close as its largest touchscreen is 5 inches and there is no Apple CarPlay and Android Auto available. Mini-hatchbacks are not a class of performance cars, and the Chevy Spark fits that mold perfectly. It comes with a 98-horsepower 1.4-liter engine that strolls the Spark to 60 mph in 10.7 seconds. Where it crushes it, though, is in fuel economy as it gets up to 30 mpg city, 38 highway, and 33 combined. 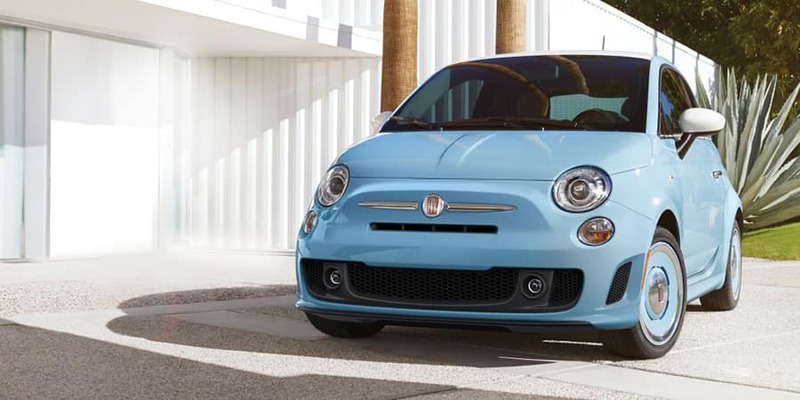 The FIAT 500 kicks the micro-hatchback mold in its boring teeth with a pair of turbocharged 1.4-liter engines. The base version, which is in the Pop and Lounge trims, pumps out 135 horsepower and 150 pound-feet of torque for an 8.1-second sprint to 60 mph. In the Abarth trim, the 1.4-liter engine is goosed to as high as 160 horsepower and 183 pound-feet of torque for a 6.9-second 0-to-60 sprint. The 2019 Chevy Spark is available in four trim levels: LS, 1LT, 2LT, and ACTIV. Their starting prices range from $14,095 to $17,495. Who Should Buy the 2019 Chevy Spark? Looking for a great small hatchback that’ll save you big money? The 2019 Chevy Spark is just that thanks to its lower price and higher fuel efficiency, it will save you in the showroom and on the road. Who Should Buy the 2019 FIAT 500? Looking for a performance-oriented hatchback that is easy on fuel? The FIAT 500 and its Abarth model are perfect for you. 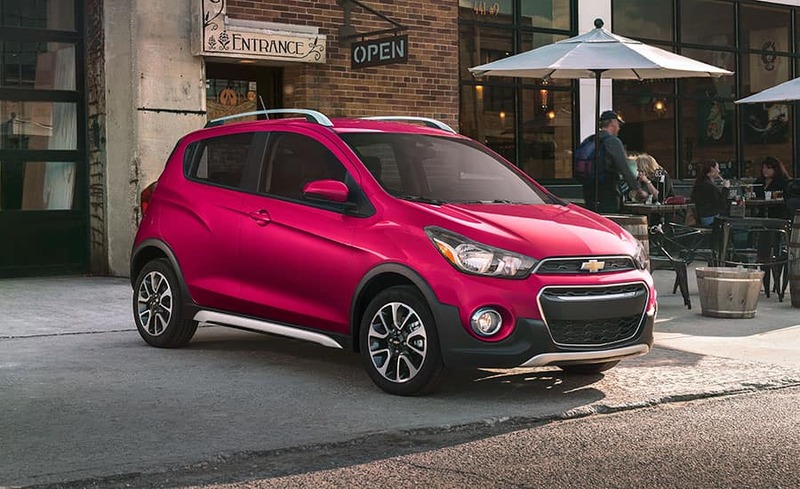 Make your commute around the Linwood area easier with the tiny and fuel efficient 2019 Chevy Spark. This small hatchback can make your daily errands around the Bay City and Standish areas quick, easy, and efficient. 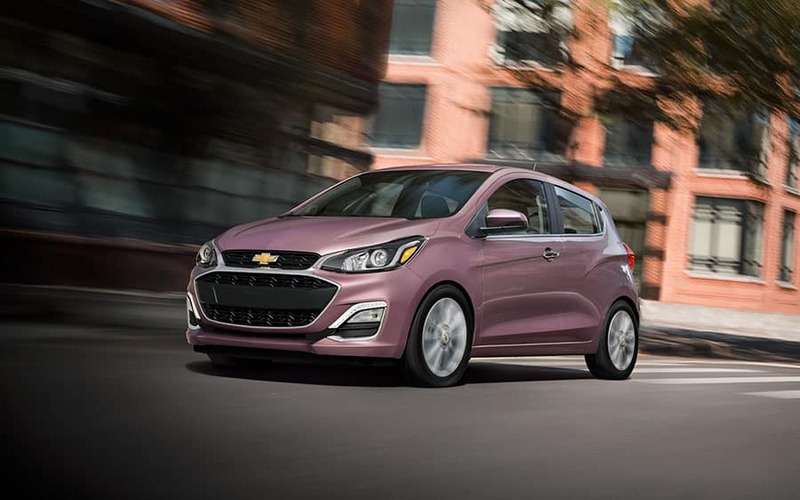 Head down to our Linwood Chevy showroom today to test drive the 2019 Spark today. If you can’t make it in today, you can check out our online inventory in the Bay City area to see what 2019 Spark models we have in stock and schedule a test drive later.